Last week I was invited to spend an afternoon with students enrolled in Experiences in the Visual Arts, at University of Denver. The class was held in one of the studios in the Nagel Art Studios building. This building, adjacent to the older Schwayder Art Building, was finished in 2010. I mention this building as ithe 12,500 square foot building was built as part of a project that also included the DU Soccer Stadium and the Pat Bowlen Training Center for DU’s athletic team. The complex was designed by Tryba Architects and provides an unusual example of resource sharing (in this case, a tract of valuable real estate square footage used for both athletics and studio arts.) As visiting artist, I had a parking pass for the afternoon and the short trek from my car to Nagel included a glimpse into the athletic training center, a stunning visual of muscular bodies interacting with their own versions of studio equipment. The course aims to explore the language of the visual arts, using it to communicate ideas about culture, history and the personal. Through hands-on exercises and experimentation in different media students work to interpret the world around them via image or object creation. University faculty rotates teaching this course; each offering typically centered around the area of expertise of the faculty teaching it. The hope is that students deepen their understanding of the creative process, and that this understanding will not only inform other areas of studies but will also enrich their lives long into the future. Catherine is a master printmaker (Tamarind trained); she teaches and runs the printmaking department at University of Denver. Prior to her position at DU (which she has held since 2003), Catherine was Master Printer and Director of the School of Visual Arts’ P.R.I.N.T. (Print Research Institute) at the University of North Texas. The way Catherine opted to teach this quarter’s EVA class is admirable. Rather than rely solely on her experience and love of printmaking, both of which are vast, she opted to introduce an element new to both herself and her students; i.e. using the book form as this quarter’s vehicle for offering up an array of visual arts experience. In a class of primarily non-art major students (only one in the group of 15), this decision increased opportunities for bringing skills and experience from each individual student’s area of study or personal history to the classroom. Using the familiar book form as a launching pad to crafting more personal physical objects, has a palpably energizing effect on the studio atmosphere. Catherine’s decision to focus on the book form, a form immediately recognizable and approachable, with the benefit of tactile, interactive and private qualities thrown in, yet one that she has little to no experience in creating, puts her on an even playing field with her students. She is learning and skill building along side them, keeping her energy fresh, the studio exuberant. Banshee Press, a design, letterpress, silkscreen and etching studio specializing in hand-printed art and ephemera owned by University of Denver alum Britt Madden and Dry Creek Arts Press, Leon Loughridge’s studio where limited edition woodblocks and artists’ books are produced. Part of the curriculum involves field trips as both prep and follow-up to the studio projects. For the altered project they were first able to visit an exhibit of my works currently on view at the university’s Anderson Academic Commons (library). 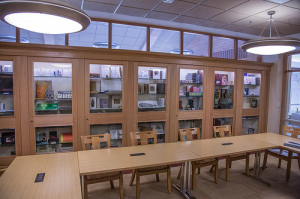 Cases were unlocked and books removed by Special Collections Librarian Kate Crowe. Had the exhibit not been on display, a similar field trip to the Gottesfeld Room for a closer look at artists’ books could have just as easily been arranged. The class will also attend a presentation I am giving at Anderson Academic Commons mid-quarter. These visits to the library to view artwork solidify the concept (and in this case, reality) that libraries hold far more than access to required class reference materials. A 21st century student’s level of exposure to digital learning tools is already high, but in this class the emphasis shifts towards Internet as a place for learning in addition to a place of research/entertainment or social networking. Their first assignment used a Sea Lemon video for binding their sketchbooks, followed up by an assignment to watch the Art 21 William Kentridge video and to write reflectively about the artist and his projects. The notion of exhibiting this classes finished projects at the library is on the table, although no solid arrangements are in place. As to me, I look forward to future opportunities to work with students both in and out of the art department at University of Denver. The already sizable and steadily growing collection of artists’ books make DU a campus rich in opportunity for using book works as teaching tools as well as a means to increase the excitement about learning interactively. Over and out . . .